Getting home loan plays a big part in fulfilling a dream, and while things are much smoother these days, some points should be kept in mind while applying for home loans in India. Applying for Home Loans in India has become much simpler and quick. However you should keep certain things in mind before getting home loans. There is more flexibility in the paper work involved too but certain factors affect your home loan eligibility even though banks and Non Banking Financial Companies (NBFC) are now consciously targeting even the self employed and professionals who seek out home loans. However there are still certain procedures to be followed and certain documentation to be kept in mind. Here is a complete guide to Home Loans in India, which will cover the things you know about home loans and some things you did not know about home loans. ID proof: Acceptable documents are PAN card, Election Card, Driver’s License, Passport Copy. Residence Proof: Acceptable documents are Latest Electricity Bill, MTNL/BSNL Landline Bill, Bank Passbook page bearing the Address of applicant, Passport Copy. Your last 3 months salary slips and in some cases a latest offer letter from your employer confirming your current pay and duration of service. Last 3 years Form 16 or Income Tax Returns duly acknowledged. Last 6 months savings bank account statement. Your last 3 years Income tax returns showing computation of Income. Last 3 years Profit and Loss statement, Balance sheet and Audit report. You maybe asked to submit any one of them or all of them depending upon the bank’s policy and level of scrutiny they put your application through so it is better keep all of them handy. Last 3 months pay slip. If you do not get one, request the HR to issue you for the purpose of availing home loans. They will co-operate and help out, or get a letter showing your current pay from them. If you work on contracts, your latest contract copy specifying your current salary/monthly payment and duration of contract. If you do not have a contract copy, a letter from the HR on your company’s letterhead specifying your date of joining the company and your current Designation and current Pay. Form 16A copy for last 3 years And/OR Income Tax returns of Last 3 years duly acknowledged. Last 6 months Bank account statement. Business existence proof: Any one of 3 years old Saral Copy, Shop establishment Act, Any tax registration Copy, Company Registration license. Consent Letter from parents or Siblings: Banks or NBFCs do not want to take chances and hence will require a consent letter from your immediate family members, who are not co-applicants in the loan or will not have their names in the property agreement you make for purchasing the new home. This a standard format that banks have in which you will need to fill in the details and the concerned person must sign the letter and submit to the bank. 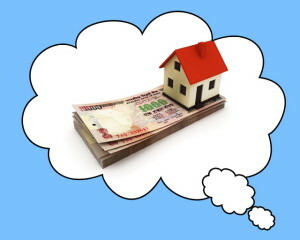 Source of own contribution: A lot of people are not aware of this, and you will not find this info in most places, but RBI has set certain regulations and as per these, the applicant must declare his/her source of own contribution that they would make over and above the home loan amount. This could be copies of your FDs, property papers of any other property you might sell to purchase a new etc. Once you are ready with your set of documents you can approach the bank or NBFC of your choice. Overall if you go by majority reviews, SBI, HDFC, Axis bank, LIC housing Finance are some of the better ones followed by DHFL, ICICI bank. The application can be made online as now almost all of these banks or NBFCs have online application forms available. Just fill in your details and submit the forms online. The banks will call you up and follow up with the remaining process. HDFC, Axis bank, ICICI have faster response than SBI, when applied online. But again it’s a matter of choice. They will even send you a relationship manager who will visit you and collect the documents and brief you if anything else is required and discuss the process in detail and clear your doubts. This person will also ask questions to cross check the documents and to gauge your repaying capacity. Don’t be surprised if your home loan eligibility is less, when you actually apply, than what you were shown online. This is because when you check the eligibility online, only your net income determines your eligibility. However in reality, when your documents are scrutinized this may vary as a lot of factors such as your savings habit, investment track record, consistency of income etc. will matter. If the bank feels there is variation in your monthly income, they may reduce your eligibility or you can opt to extend the tenure of your loan. You may also be asked for a Guarantor, who is below the age of 50 years and has income equal to yours or higher, to vouch for you and sign the guarantor form, to assure them of timely repayments. Typically the charges involved while getting a home loans are the processing fees and a stamp duty which the bank will let you know when you submit the documents to them. This is usually not more that 1% of the loan amount and can be much lower as well. They will collect a cheque for the processing fees. In some Public sector banks you may need to pay for legal verification of your property once you finalize it, whereas the private sector banks or NBFC will take these charges in the processing fee itself so you have to just pay them once. Once you have submitted the application and processing fee cheque, the bank will start the verification of your income, ID, residence, place of work, nature of employment etc. These verifications will be via telephonic conversation, 2-3 visits to your office and 2-3 to your residence by different representatives on behalf of the bank to verify. In one of the visits to your office, the bank representative will ask to meet up with the HR or whoever is responsible for payments to cross check your salary and to validate the salary slips you submitted. Once these verifications are complete you get a confirmation call. If all the papers are in place and the bank is satisfied with the verifications and convinced that you will be able to pay the EMI corresponding to your loan application, it will sanction you loan subject to some conditions which will be mentioned in the loan application, such as you providing a guarantor or any consent letter etc. Go through the terms and conditions carefully, if any charges are mentioned to be paid, then see by what date these are to be paid. Most likely these charges could be nominal, and would be any difference in the processing fee that may have been overlooked. Trust me, they will even ask for a single rupee if that is left out. Someone I know has paid Rs. 4/- by cheque as that was a difference in the processing fee. The sanction letter by most banks and NBFCs is valid for a period of 6 months. This letter will have the home loan rate of interest applicable, tenure of the home loan among other things. Once you finalize a property, you will have to get it checked with the bank your loan is applied in. Axis Bank, ICICI Bank or Companies like HDFC (HDFC bank and HDFC home loans are separate entities) have their own legal department and you need to just submit the relevant documents to them and they will proceed to evaluate the property. Some public sector banks may direct you to their legal department and you need to fix up an appointment with them, whereas private banks may do it themselves and you need not worry. Legal verification is important as it will negate any future problems for you and safeguard your interests. Copy Original Sale agreement and all subsequent sale agreements if the property being sold has undergone sale more than once; also known as chain of documents. Copy of CC and OC from the builder or previous owner. In case of under construction house, the OC may not be available, the bank will ask for any other legal document it may need from the builder. Society registration document, in case the property is resale. Parking allotment letter if the property comes with a parking space assigned to you. Stamp duty and Registration receipt of the property you are buying if it is a resale property, not applicable in case of under-construction property. Floor plan of the house you are interested in buying, mentioning the carpet area and other details. Society NOC in case of the house being bought comes under a registered housing society. Once all the verifications are done as per bank’s satisfaction, they may give a go ahead for registration and stamp duty of the current property. At this stage the bank will require you to contribute your own contribution to the property that is not covered by the loan and stamp duty and registration paid. The bank will take all the original documents of your property and expect you to fulfill any other condition mentioned in the sanction letter, and once satisfied will give you the cheque for disbursement, which will be in the name of the seller. It will either take post dated cheques from you for your future EMIs or you can always opt for ECS or Direct Debit from your bank account. At this stage, ask for a LOD or List of Documents from the bank to keep a record of all the original documents they have for your property. You do not want to be in for any surprises at the end of your loan payment, if any document goes missing and the bank simply says they never had it. Once all this is done you are now ready to get the keys to your dream home. Getting a home loan is tricky but not a difficult process. If your paperwork is clear and the property you need to buy is legally clear, the loan procedure can be smooth. However beware of any other unnecessary policies or plans sold to you along with the home loan. One should however, insure the home loan or take a term plan to cover for the loan amount, to safeguard against any unpleasant even happening to the borrower.